I have to admit that between Dr. Kazemi and his well-trained staff my procedures went smoothly and there was no need for my anxiety." Dr. Kazemi is from Long Island, New York . He attended New York University for his undergraduate and dental education on full academic scholarships. He then received his certificate in Periodontics after comp leting the three year residency program in 1997 at the University of Pennsylvania. Dr. Kazemi was selected as the Nobel Biocare Implant Fellow at Penn completing his advance implant training in June, 1998. Dr. Kazemi's honors include OKU (Omicron Kappa Upsilon) membership (1994) and the Director's Award in Postdoctoral Periodontics at Penn (1997), where he has been a Clinical Assistant Professor since 1997. 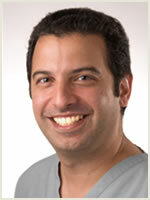 Dr. Kazemi continues his commitment to continuing dental education as part of "Drs. Sullivan, Yasner and Kazemi's Study Club". Dr. Kazemi is a staff member at West Jersey (Virtua) Hospital. He is a member of the American Academy of Peridontology and the Ame rican Academy of Osseointegration. In May 2003, Dr. Kazemi became Board Certified as a Diplomate of The American Board of Periodontology. Outside of dentistry, Dr. Kazemi is an avid soccer and tennis player and enjoys travel and spending time with his family.